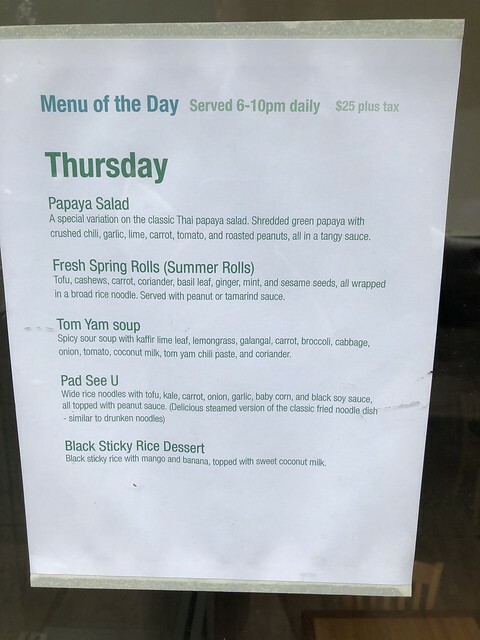 My curiosity about May Kaidee, the new vegan Thai (Thai vegan?) restaurant, has been sated. Quite surprisingly, as a matter of fact, as the flavors coaxed out of the products used in this vegan meal were delicious. It should be known that I'm fairly anti-vegan, at least as much as militant vegans are when discussing their love of omnivores. Don't expect much in terms of decor or service, as it's located a few steps down (garden level, in real-estate terms), in a nondescript space on East Broadway, practically across the street from the historic Seward Park Library, and directly across the street from our apartment building. It's also next-door to the building used in scenes from Mr. Robot, as well as down the block from the "consulate" building from Flight of the Conchords. And the food easily ranks with the best of the Thai food we've eaten in Manhattan, only a little sweet at times, but lots of sour, some bitter and heat, all in good proportions. Food comes quickly, and as I mentioned no real decor - the first two courses were served in little wooden salad bowls, like one might've used at the Sizzler in the 1980s. I wonder when and if they'll secure a liquor license, as their location is next door to the Primitive Christian Church...don't tell anyone, but we snuck in a bottle of sparkling wine and a few beers, and I have no idea what their drink offerings consist of. May was in the house, and was quite pleased to come out and talk to us at the end of the meal; we were smitten enough to buy her cookbook. Here is is a sample menu from last Thursday; we dined on Saturday night, and the main had changed to a curry dish, with just enough (i.e. not too much) tofu, potatoes, carrots, broccoli, onion, etc. etc. Oh - the dessert changed as well; our's was steamed pumpkin in coconut milk.